Detectives. Scientists. Listeners. Educators. Partners. Advisors. These are just a few of the attributes that describe the top-rated, patient-centered heart and vascular specialists at EvergreenHealth. 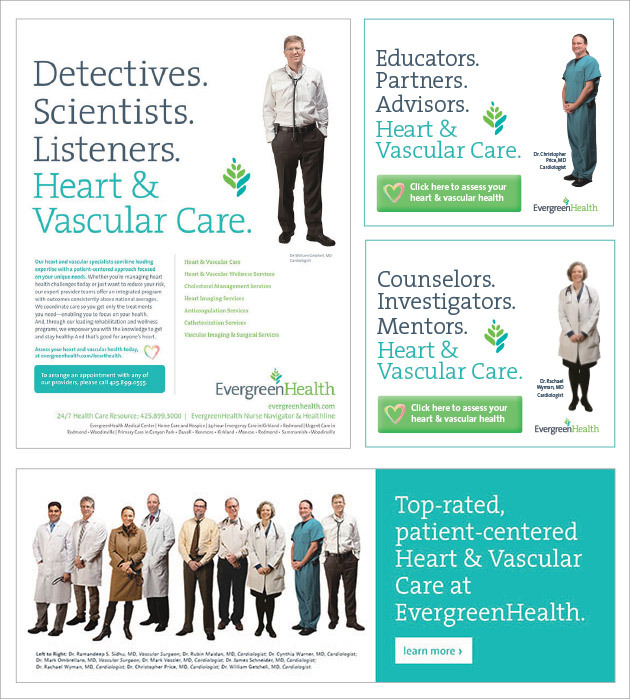 We worked with their cardiovascular team to develop a campaign that focused on the expert, personal care delivered by EvergreenHealth to their patients. By calling attention to the qualities that make their cardiologists and vascular surgeons unique, we delivered an empowering message of complete and integrated care—driving the community to be knowledgeable and healthy. And that’s good for anyone’s heart.